Thanks for coming back for another installment of Not a Cradle Catholic, where it's all about those of us who did NOT grow up in the Catholic Church. Why did we join up? What have we learned? Why is our perspective unique? I hope you'll follow along. Whatever your background, maybe there's something you can learn from us. MaryRuth has the privilege of being a wife of 15 years to an amazing man. Together they have four children on this earth and one praying hard for them in heaven. She holds a PhD in Educational Psychology and has studied Human Development and Psychology both in the classroom and in the home. She has always wanted to bridge the gap between research on child development and actual parenting and tries to do that at her blog, Parenting with Peer Review. She loves writing, family, coffee, wine, chocolate, office supplies, the Catholic Church, watching her boys play soccer, historical fiction, and time gabbing with girl-friends. She does not love proof-reading, unloading the dishwasher, traffic, returning phone calls, scorpions, or the post-office. Find her on Facebook, Insatgram, and Pinterest. How long have you been a Catholic? I came into the church Easter of 2007, so 8+ years now. What was your main motivation for entering the Catholic Church? I like to say I have a baby saint who led me to the church. I lost a baby before she was born in 2005. I was of course a total wreck and my husband asked if I would like to talk to someone about it. We were temporarily living out of state for the year because of my husband's job and I was pretty isolated socially. We had been attending a Catholic Church because it was convenient and my husband had been raised Catholic. He made an appointment with me to speak to the priest and his words were so soothing. I was reassured by the fact that the Church recognized my loss as the loss of a life, not just a potential life. But more than that, I felt the presence of the Holy Spirit and wanted more. My heart was pulled to the Church so I started doing the research. The deeper I dug, the more convinced I was that the Catholic Church was the One True Church. Which Church teachings were easy to accept and which were stumbling blocks? Natural Family Planning was crazy hard for us to accept. My husband was a cradle Catholic but also a bit of a potluck-Catholic at the time. He was worried we would end up with a bazillion kids. We had already been using oral contraception so embracing NFP required a total change in both of our mindsets about kids, about life, about openness, and about marital love. It was tough, but one of the best things we have done in our marriage. Is there anything you miss from your pre-Catholic days? Not really. I feel like I haven’t lost a single thing, but I have gained so much that protestants had just dropped. The teachings of early Church Fathers, Church tradition, the Saints, feast days, The Eucharist, Our Blessed Mother, oh my! Is there anything you really do NOT miss? Growing up it seemed like our church was successful if it had lots of people giving lots of money, and the pastor's job seemed to be to keep people coming back by keeping them entertained with a good sermon. The pastors didn’t challenge us to grow in our faith but rather seemed to say what the people wanted to hear. The sermons I heard growing up were just really fun or interesting stories - but rarely really challenged me spiritually. The sermons were the focus of every service rather than Christ in the Eucharist. I like having Christ as the focus - body, blood, soul and divinity. I love having the Church here to challenge me to continue to grow in holiness. I love that the Church just teaches the Truth - take it or leave it. In what ways (if any) has your relationship with Jesus changed since becoming Catholic? I have learned to listen to Him. To hear Him in my heart. I have learned to read the Bible. I have learned to pray and connect with Him. I have discovered countless ways that I can grow to be the daughter He desires me to be and I learn more each day! What do you think Catholics can learn from our protestant brothers and sisters? Our protestant brothers and sisters have really done a beautiful job marketing Jesus, evangelizing, and entertaining. They make it fun. They make it their mission to make sure that everyone feels welcome and loved in their churches. They reach out to everyone and make church a fun place to be. That is hard for us because we have our tradition and we are fairly unchanged for the last 2000 years… but I think we can do a little better job marketing at least! Biggest misconception non-Catholics have about Catholics? That we don’t have a personal relationship with Jesus Christ. That is bonkers, but I think many believe that to be the case. I have grown so much in my own individual relationship with Christ since my conversion! Favorite saint and saint quote? I don't know that I have a favorite saint. I love St. Claire and St. Catherine but I think St. Theresa is probably the one with whom I can most personally connect. I love her writing and her struggles and honesty. She has challenged me to grow in my spiritual life and challenges me intellectually as well. I think we could have been really good friends, but maybe we are becoming friends yet! Abbey writes her life as a homeschooling mom to a small collective. She muses about parenting, practicing gratitude, and celebrating the liturgical year with her young family at Surviving Our Blessings. In her spare time, Abbey enjoys running, knitting, coffee and cookbooks, not usually all at the same time. Find her on Facebook, Instagram, Pinterest, and Twitter. I entered the Church at Easter in 2002, so 13 years this past Easter. I grew up Southern Baptist (along with every member of my family, living and dead). I was never a very good Baptist. I asked too many difficult questions. I appreciate being part of a tradition that values scholarly inquiry and intellectual discourse...those and the depth of the liturgical practice were what drew me in initially. What kept me there, though, was the Mass and the presence of Jesus in the Eucharist. It was like a magnet. I miss old-fashioned hymn sings. There's an entire hymnal of really good old Gospel hymns that I don't get to sing in a group any more. I try to make up for it by playing and singing them at home, but it's not quite the same. I don't miss skipping from Palm Sunday to Easter with no Holy Week in between. I don't miss the long exegetical sermons that go through the text a line at a time and last 45 minutes. And I really don't miss the altar calls with verse after verse of Just As I Am while we wait for someone to feel guilty enough to step out of the pew and come forward. Growing in faith as a Catholic Christian has helped me move from Jesus in my head to Jesus in my heart. It's ironic- the entire focus in my childhood church was on whether or not Jesus was in our hearts. I believed He was there, of course, because I had invited Him to be. Experiencing Jesus in the Eucharist, though, brings him much more into the forefront of both my mind and my heart. I feel His presence much more closely now and relate to Him more intimately on a daily basis. All traditions have valuable insights for each other. The key is to look for the gifts that the Spirit has given to each denomination. Some things that come to mind from my relationships with Christians who are not Catholic (and from spending time in those churches) is a strong Biblical knowledge that is taught from a young age, a missionary zeal and fervor for sharing Christ with others, a warm sense of hospitality, and great singing during worship. From my Mennonite brothers and sisters, particularly, I appreciate the witness for radical peacemaking and justice for the marginalized. These things are all very Catholic, too- we just tend not to emphasize them quite as much in the same ways. That we worship saints and Mary. That we don't know the Bible. That we think the Pope is a perfect person who doesn't make mistakes and that he thinks for us. "Do not fear, the poorer you are the more Jesus will love you. He will go far, very far in search of you, if at times you wander off a little." Amy hails from the great state of Kansas, though she has lived the last 13 years away from the “Land of Oz” traveling the country with her Air Force Airman. She has lived in Ohio, Florida, California, Virginia, and is gearing up to move to Las Vegas, Nevada. She graduated from Kansas State University in 2001 and married her love, Dustin, that same year. She has three amazing kiddos–two daughters and a son. She is the founder of Passionate Purpose, a website dedicated to promoting healthy marriages and dating relationships. I became Catholic in September 2009, so six years now. Protestant. I was raised in the Disciples of Christ Church. When I married my husband, he was a Catholic and I was Protestant. Dustin wanted to remain Catholic, I wanted to remain Protestant. And so, we fought. Correction--I fought. I spewed out all the things I thought were true about the Catholic Church at Dustin and he remained calm, patient, and loving. He countered every single one of my baseless untruths. Soon, there was nothing I could say. He had an answer for everything. I was so frustrated, but I refused to concede. That would mean that I was wrong. That would mean that I had believed in untruths and that thought was humiliating. 1. The Eucharist. The desire to receive became overwhelming. 2. The history is there and I can't dispute it. If this was The Church founded by the apostles at the very beginning than that is where I want to be. The history is rich, intriguing, mysterious, and supernatural. Again and again, I am left in awe as I continue to explore the only Christian church that has been around for over 2,000 years. 3. It ignited a flame in me. The beauty of Catholicism has brought me closer to Jesus in numerous ways. So much of what the Church teaches, I had never even heard before, such as Jesus being present in the Eucharist, Mary's Immaculate Conception, the Church's stance on contraception. It was all a lot to take in. I think the thing that was hardest for me was the teaching on contraception. I had taken birth control since I was 17 and never thought a thing of it. It was just what everyone did. When I actually had to think about why I was taking it and if it was good for me and my marriage, it was hard to swallow that pill. The symbolic gesture of communion. Nothing, I mean nothing, beats Holy Communion in the Catholic Church. In every way! Catholicism has brought me so much closer to Jesus. I pray more, go to church every Sunday (if not prevented in someway), I have Bible studies with my kids; I see everything in a different way. They know their scripture. They can quote it, they know where to look in the Bible for what they want. They know their way around the Bible. As Catholics, we need to be better about this. Uh, everything! LOL! I used to believe in all the untruths that non-Catholics believe. To pick just one would be hard. But, I think the biggest misconception is that they don't understand that the Catholic Church isn't just some denomination. It's THE Church founded by the apostles. We have that lineage, that history, we can trace it back to the beginning. They are Protestant because someone long ago broke off from the Catholic Church. I never understood this and I don't think many Protestants do either. Isn't that the greatest call to purpose in this life? I sure think so. stay tuned for more stories, and as always, keep in touch! If you've been hanging around here for a while you probably know that I did not grow up Catholic. 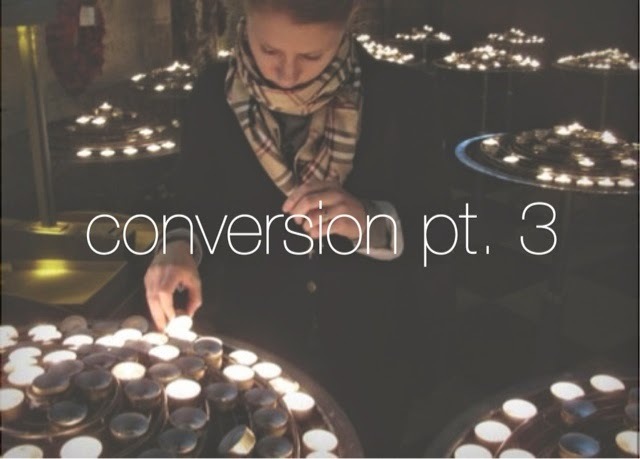 If you haven't read my conversion story yet, you should check it out. Faith has always been a huge part of my life and my decision to join the Catholic Church was the natural culmination of my childhood formation that I never saw coming. Whenever I meet other converts I always want to ask them why they did it, what made them take that big step. I want to know if the Catholic Church surprised them as much as it did me. So that's why this series is here. It's all about those of us who are NOT cradle Catholics. Why did we join up? What have we learned? Why is our perspective unique? I hope you'll follow along. Whatever your background, maybe there's something you can learn from us. Thanks to all who so willingly participated and I hope you enjoy hearing their stories! We (my husband and I) joined the Church in 2005 at Easter so a little over 10 years. I look back on it now and I see that I was just drawn to the church. I especially wanted to be able to pray the rosary so I feel like Mary was calling me home. I started to question the validity of the Lutheran church splitting from the Catholic Church and when that fell apart it was easy to switch. NFP was the hardest. I told God that I could do anything except I would not do that. Until January of the year we were in RCIA and Christopher West came to town to speak. We went to the all day long talk and were convinced and immediately learned NFP. Most of the things seemed pretty easy, which looking back must have been the grace of God and the Holy Spirit. I had lots of questions but the answers mostly just made sense and were easy to take. I miss being the same denomination as my family. I can't think of anything. I was a pretty lukewarm Lutheran though. My relationship is deeper, my prayer life is stronger. I have more trust I think. "The world's thy ship and not thy home." Sterling is a wife and mama to three girls under 5, lives in Boise, Idaho and is the host of the Coffee & Pearls show. As an adult convert, she had to discover Catholicism on her own. She is so in love with the truth and tradition of the Church that she dedicates her life to helping lukewarm Catholics discover the passion and joy of our great faith! She writes at Sterling Jaquith. Also find her on Facebook, Twitter, Instagram, and Youtube. I converted to Catholicism officially in 2010 but it took me two years to actually embrace and love my Catholic faith! I was a very conservative Evangelical Protestant before. I fell in love with a Catholic man and I didn't want to raise my children in a split-religious household. I felt sure that God wanted me to marry this man so I decided that God must also want me to become Catholic! I easily accepted going to Mass every week and turning to the Saints for wisdom. I struggled to understand why we had to practice Natural Family Planning and it took me a long time to understand the beauty and the power of Adoration and the rosary. I miss the bible studies and the scripture memorization which was so common among my Protestant friends. I just don't see that happening as often with my Catholic friends. We don't talk about Jesus as often. I miss the music too. I would go to Protestant church and meet Jesus in song. Now I love the true presence of Christ in the Mass but I wish more people joined in singing the hymns! I don't miss the hypocrisy. I look back now and I see so many Protestants put on a smile and said JESUS but it's a culture built on bending the rules and choosing what you want out of Christianity. After consecrating myself to Jesus through Mary I feel so much closer to Him. I feel as if knowing her has helped me to know Him better. I love sitting and chatting with Him in Adoration. I never experienced anything like that before. Protestants have great confidence that they can convert people. We should have that too! We should try harder to inspire more people to become Catholic. Yes, you do have to hook people with warm and fuzzies but we have all the good and true stuff to back up what we're saying! We need to evangelize more and do it with joy! Two things! One, Catholics aren't being forced to "have all the babies" like we're part of some brain washed club. I always thought I'd only have two kids. Now, after being Catholic and spending time with so many bigger families, I see the love that those families share. It's that love that has inspired me to want a bigger family. Being Catholic has just opened my heart to sacrifice and to embracing love. Second, everything about Mary. And that's been hard for me. I now love Mary so much and she's such a big part of my life that I'm saddened by all the Protestants who leave her in the background and don't think about her much. It's such a lost opportunity because she really is amazing and we don't worship her, we honor her as the mother of Christ, as we should! "If you are what you should be, you will set the whole world ablaze!" Emily is a wife and stay-at-home mom living the Midwestern dream with her little family. She is a lover of chocolate, coffee, and comfy sweaters. You can find out more about her and read her ramblings over at Raising Barnes. It is a hard thing to put into words. Growing up, I was pretty active in church activities and had lots of "friends" there. But there was just something missing. I went on my first Lifeteen retreat my senior year of high school (2007) with my best friend; after that, I started attending more youth group functions with her as well. I felt a kind of peace and acceptance among those people that I had never felt in all my years growing up. That level of acceptance made me look into the faith more - what did these people have that I had been missing all those years??? I wouldn't say that anything was necessarily easy to accept for me, but I didn't have a lot of stumbling blocks either. I was very lucky to be surrounded by people who were willing to listen to my concerns and answer my questions. There were things that didn't always make sense to me, but I felt a peace that eventually I would understand them. There are lots of things that I'm still learning to appreciate, even today! Having a common faith with my parents has been the hardest thing. They were supportive of my decision to convert, but I think it is hard for all of us to not share that common bond anymore. They attend Mass with us once a year (Christmas), which I am so grateful for, but it just isn't quite the same any more. The traditions and rituals of the Catholic Church are just so beautiful and amazing to me! I really don't feel like I'm missing anything from the faith that I grew up in because the Catholic faith offers so much more! I am by no means perfect or an expert when it comes to my relationship with Jesus, but I do feel like He became more real to me after becoming Catholic. Growing up, we were never really taught how to have a relationship with Christ. To me, He felt more like a distant character than someone to have a living, breathing relationship with. Becoming Catholic made Him more real to me, making that relationship feel more attainable. But it is always a work in progress. The importance of community. There were (are still are) lots of opportunities to gather and build community in the church that I grew up in. That was the hardest thing coming into the Catholic Church - there wasn't an obvious group that I felt like I could belong to. This could look different depending on the parish you attend or the city in which you live. And there have been so many changes, even in the 6 short years that have passed since I became Catholic. But, I think it is still an important thing to emphasize community - our faith is both personal and communal. That our faith is weird, perhaps bordering on fanatical. I didn't experience too much Catholic "bashing" growing up, but some of the stories I did hear seemed so ... odd. Did Catholics really believe they were eating Jesus?!? Once I learned more, Jesus' presence in the Eucharist became a beautiful thing, but when you only hear snippets of it, it all sounds very strange. "If I ever become a saint - I will surely be one of 'darkness.' I will continually be absent from Heaven - to light the light of those in darkness on earth." stay tuned for more stories. And as always, keep in touch! These are the opening lines of a song that has been playing on repeat in my mind over and over again for the past few weeks. The story is somewhat personal, but I think it's something some of you may be able to relate to, so to me, that's a good reason to share. When I shared my conversion story a couple months ago one of the things I talked about was how before I became Catholic I had relied on praise and worship music and feeling "emotional highs" in my relationship with God. One of the things that was really hard but really good for me to learn as I was entering the Catholic Church was that I could praise God without contemporary music. In fact, I could praise Him with no music at all. I learned that God was active and present in my life regardless of what I might be feeling. I went about a year without regularly attending a contemporary worship service. I was really settling in to more traditional forms of liturgy, but I still missed having praise and worship music in church. Well, imagine my joy when Alex and I started going to a church that offered a more contemporary mass! And they were looking for people to help with music! We jumped right in and it was such a blessing to sing the praise and worship songs that I had loved for years right along side the ancient Catholic liturgies that I was learning to love. I played piano and sang every week for 3 years until Johnny was born. Having a baby has forced me to cut back my involvement in music ministry a little bit, but I still lead worship for "Emmaus", a night of adoration, confession, and praise and worship that our parish holds once a month. Sometimes I don't feel like going, life is so busy, sometimes I wonder if I should give up this volunteer opportunity as well and just focus on the needs of my family. But I every time get to church and start singing I'm always so glad I get to do it. And I couldn't sing them. Every time I tried I got a huge lump in my throat and my eyes started welling up with tears. I couldn't quite understand what was going on because it had been so long since I had had an emotional experiences during a worship service. I wouldn't say I'm going through spiritual dryness. But I will say that even though I'm seeking the Lord on an (almost) daily basis I don't regularly feel His presence in the way I would like. I know He is present and working in my life, but I don't always feel it. And I know that that's ok. But in that moment I felt the Holy Spirit working on my heart. Did I mean the words I was singing? "Take me deeper than my feet could ever wander". That's a scary request to make of The Lord. That's essentially asking the Lord to take me to a place where I have no control so that I have to trust in Him. I have been in places like that before. Miscarriage. Two years of infertility. A baby in the NICU plus 4 separate surgeries. I don't like being in those kinds of places. Why on earth would I ask God to take me there again? Because there "my faith will be made stronger." Things have been pretty easy around here. No, having a toddler is not always easy, but I know what to expect. I essentially know what each day will bring. I'm pretty comfortable with our routine and I feel like I have things pretty well under control. Control. That's the key word. I like being in control. But maybe I'm not supposed to be in control. Maybe I need to give up control in my life and surrender to the Lord's will. I don't know what that will look like yet, but I am preparing myself to follow when He calls me out on the water. It's scary when that happens. But I know from experience that being in His will is the best place to be. This post will not make much sense unless you have read this post and this post first. Are you all caught up? Ok, great. Inside Notra Dame Cathedral- Paris, France. Spring brings new life, flowers, bird songs, and proposals. Alex proposed to me in April of 2009. We decided we wanted to get married that coming fall, and I knew that I wanted to be Catholic before we were married. About a month before our wedding, in our home parish, I was received into the fullness of the Catholic Church with the sacrament of confirmation, and I received the Eucharist for the very first time. My parents as well as Alex's were there. And Alex was my confirmation sponsor. As I stood at the front of that church I thought about all the times growing up at camp that I "came forward" to accept Jesus. There were butterflies, tears, and lots of hugs from friends afterwards. This was nothing like that. I waited for butterflies – but my stomach was calm. I blinked hard, thinking that if I could shed a couple of tears that would be proof that the Holy Spirit was indeed working in me. But my eyes remained dry. There were no emotions to ride. But there was peace. A deep, quiet peace. Our priest asked me if I believed in God the Father, Jesus Christ His Son, and the Holy Spirit. And if I renounced Satan and all of his ways. And to each of these I answered yes. Then he asked me if I believed in the teachings of the Catholic Church and held them to be true. Although I had made the decision to become Catholic months before, this was a question I would not have been able to answer "yes" to until just a few weeks before. In the grand scheme of things, my beliefs really weren't changing at all. The faith that had been handed to me by my parents shared all the main pillars of the Catholic faith: the Trinity, the divinity of Jesus Christ, and the salvation we have through Him. But there were many teachings of the Catholic Church that, for the majority of my life, I had held to be false. It was only in the last year that I had begun to consider that maybe, just maybe, I had been wrong about that. Then one doctrine at a time, through prayer and study, my heart was being turned, my eyes were being opened, and I was seeing truth where I had once seen lies. It all stared with NFP and openness to life in marriage. Because I trusted the church so much on that issue, it made it easier to trust the Church about transubstantiation. And when I wrestled with Papal infallibility, I found confidence in the trust I had already established. And so I stepped out in faith. It was just a small step, followed by another and another. It was easy to agree with some teachings, like the use of scripture AND Tradition. Having grown up Lutheran I will say that I could feel my heart jumping out of my throat the first time I heard Sola Scriptura referred to as a heresy. But when I looked at the vast number of protestant denominations, all claiming sola scriptura as truth, and all arriving at totally different teachings on the same subjects, I knew there had to be something guiding the interpretation of scripture. Tradition is the rudder that steers the study of scripture. Tradition is what the first generations of Christians relied on before the New Testament was even written down. Tradition (cue Fiddler on the Roof music) doesn't mean that God can't speak to me directly when I read my Bible – He can, and does! But it does mean that after 2000 years the Catholic Church has remained faithful to all of her precepts. There were some teachings that took a little more time to come around to, like purgatory, and teachings on Mary. With both of these I found there was just as much scripture arguing for as there was against. Purgatory made sense, or at least as much sense something as mysterious as life after death can make. But for some reason I could not come to terms with Mary. I believed she was theotokos, or God-bearer, I believed she was incredibly unique and blessed because of this, I believed what the Catholic Church teaches about her. But I couldn't ever see myself going to her for prayer, as an intercessor before her Son in heaven, and I certainly couldn't think of her as my own spiritual mother. I was put at ease a little by our priest who told me that a devotion to Mary was not dogma of the Catholic faith. And at the time I thought "ok, I'll just be one of those Catholics that's just not that into her." It wasn't until a couple of years later that I began to understand Mary a little bit. And so I said "yes", that I believed the teachings of the Catholic Church and held them to be true. Does that mean everything makes sense to me all of the time? No. But the eyes of faith see more than my human understanding. So I look to Jesus and continue to study and learn about this rich heritage I now share in. One month later I said yes to Alex, before God, and all our family and friends. It's true that in some sense I became Catholic because of Alex; if it wasn't for him I never would have have even considered it. But it was the Holy Spirit that lead me to become Catholic. I became Catholic 5 years ago, but my conversion is still happening. When do you become a master of something. What does it take to get to the point where you can say, "I'm really good, in fact, I don't think I could be any better." I'm of the opinion this never happens. The closest I've ever been to being really good at something was when I was doing my undergraduate degree in piano performance. I practiced 3 hours a day, 7 days a week. I saw the fruit of all that practice as my skill developed. But the more I practiced and the more I advanced only showed me how much MORE work I would need to put in to be a truly great pianist. I don't think world renowned musicians like Yo-yo Ma, Itzhak Perlman, or Emanuel Ax ever think, "I've arrived! I'm the best! I don't need to practice any more." Or think about doctors. I don't think they finish med school and say, "Finally, I'm done learning about medicine!" Ok. I don't actually know enough about sports to draw a sports analogy, but I think you get what I'm saying. And now I'm going to connect it to the Christian life- specifically prayer. I hope that one day I will be able to honestly say that my prayer life needs no further improvement. But I don't really expect that to happen. I think a prayer life is one of those things that requires a lifetime of practice, and can always get better, and if fed, will grow to no limits. This past year as I adjusted to being a mother my prayer life, along with other spiritual practices, had almost come to a stand still. Yes, we'd pray before meals, and yes, we'd pray for Johnny before bed. We had some times of crisis (Johnny's hospitalizations) that drove us to our knees in prayer. But daily personal prayer, reading and contemplating scripture, seeking the council of the Holy Spirit, that's what I have been lacking. I realized I needed to restart my prayer life after going to confession for the first time in over two months. My priest first told me that as a mother my strength is being constantly drawn upon and that I need "refill" with the healing graces of confession at least once a month, but every other week would be better. He also pointed out to me that I have been confessing the same things for quite a while. I already knew this, but I think I had accepted that those are the things that I will always struggle with, and thanks be to God I can bring them to confession. Actually, I was just being lazy and not trying to grow and change in between visits to the confessional. I was not feeding myself during the week. I was drying out, my spirit becoming malnourished and withered. 1. I have a rule for myself: no social media until I have done some sort of morning prayer. 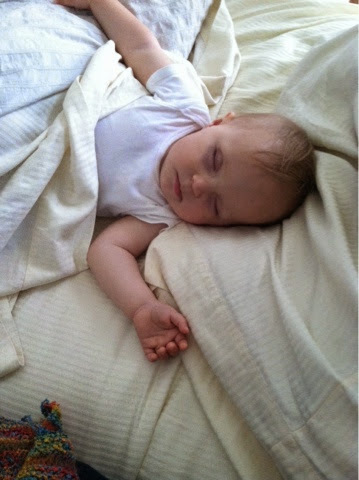 Sometimes I do this before I get out of bed, usually it happens while Johnny is in his highchair eating breakfast. I have the iBreviary app on my phone and often use their simple form of morning prayer. Sometimes I just say a daily offering, or something else to give the day, and myself, to the Lord. 2. I try to do the daily readings. If I'm pressed for time I just read the gospel for the day. It nice to know I'm reading the same scriptures that are being read at every Mass in the entire world today. It keeps me connected to the Church, even though I can't attend daily Mass. (Another goal for another time.) It also gives me a context for the Sunday readings each week. After I read I spend a few moments reflecting. I do this with a pen a paper, because that just helps me think better. I write down any prayer intentions for the day, people who have been on my heart. And I make a resolution for the day based on the gospel reading. The resolution is my faith in action. I've just heard the Word, now I'm going to act on it. Sometimes it's concrete; instead of watching TV during Johnny's nap I'm going to do some spiritual reading, or write the fruits of the Spirit on a note card and put them on my bathroom mirror. Other times it's more abstract, like be patient when Johnny is difficult- much easy to write in a journal than to actually do. It's not always easy to think of a resolution, and it's not always easy to carry it out. But this is the part of my daily devotions that I have most enjoyed and that has born the most fruit. Try it! In case you are asking how I do this with a 13 month old at home, the answer is: while he's in his highchair, occupied with food. And really, it takes me about 10 minutes. 3. I have an alarm set on my phone for 3:00 pm everyday- the hour of Divine Mercy. Tradition holds that 3:00 is the hour of Jesus' death on the cross. Many Catholics stop at that hour to remember Christ's passion, say a short prayer, and draw from the vast ocean of mercy that He made available to us while on the cross. It's quick, it's easy, thanks to my smartphone I don't even have to remember it, and it's a nice way to bring some peace into those afternoon hours, when things start to get crazy in baby-land. 4. I do an examination of conscience before I go to bed. This is the hardest one for me. By the time I get into bed I am so tired and the last thing I want to do is look back on the day to figure out where I screwed up. But when I examine my life today it helps me do better tomorrow. I am aware of my weaknesses, I ask forgiveness of the Lord, and sometimes Alex. (probably not enough of Alex.) I go to sleep in peace. This is what I do. It's not perfect. Some days I don't do everything. Some days I don't do anything! But I've got a plan, and the more I do it, the easier it becomes. I'm practicing prayer. I'm opening my heart to Jesus, and He is so eager to come in at satisfy me. What about you? How do you make prayer happen in the everyday? What works? What doesn't? but prayer stretches them and makes them capable of loving God. I think there is some quote about how having kids can be scary because your heart goes walking around outside of your body.... Has anyone heard this? Do you know what I'm talking about? Anyway, I've been thinking about that a lot, cheesy as it is, because it's kind of true. You bring a new little person into the world, who is very much a part of you, but you can't always control how the world treats them. You want to protect them and ensure that no evil will ever befall them and that they will have a good and fulfilling life. But some things are out of your control, and things don't always go the way you planned. I've been thinking about that a lot too. Johnny is one now. We've had him for and year and it's been great and he is amazing and brings so much joy. But this past year has also been the hardest, scariest year of my life! We have experienced things that I never imagined I would go through. We are a strong and united family because of it, but that has not come without pain. I have been thinking about how before Johnny was born we prayed everyday that we would have a healthy baby. And then our baby was born with some pretty major birth defects. I'll never know why God didn't answer our prayer. Or rather, answered differently than what we wanted. But I know that for whatever reason (to grow, to learn, to give Him glory) he has allowed us pass through great difficulties, and what's more, has been faithful, has been a comforter, and has provided strength when we needed it most. And here we are, a year later, happy, enjoying good health, enjoying our baby. I like to be in control and I wish I could make it so that Johnny doesn't have to suffer any more in his life. He's been through so much, and doing so well. But there are still some unknowns in regards to his health. Namely his neck. I think I have mentioned before, back in December we were told that the top two vertebrae in his neck didn't fuse together properly, thus leaving a week joint which caused his head to tilt to the left. We were told that worse case cinario, Johnny would heed surgery to fuse that joint together, correcting the head tilt, but leaving him with a pretty limited range of motion in his neck. Whether or not he would need this was a complete unknown, and we were left to wait and see how his bones would continue to grow. Six months have gone by since then, and it's time for some follow up X-rays. These will be done Wednesday morning. His neck looks so much better than it did, and I can't help but feel great optimism. (Which I am always hesitant to do.) If you are reading this will you please join Alex and me in praying for great results, and that no surgery would be required? I know that The Lord is good, that He is in control, and that I am not. And whatever happens, He will see us through.